Drew, a Hobsons college intern, describes his high school counselor’s experience using Naviance at a public school district with a high student-to-counselor ratio, amidst steep budget cuts. In 2010, as I was about to step foot on the main high school campus as a sophomore, a series of cuts to the Ohio federal funding for education sent the district reeling. After failing to pass a pair of levies that aimed to help stop the bleeding through the support of local tax dollars, the administration was forced to look for other ways to make room in its budget. The problem was compounded by the shear size of the district — Lakota Local Schools, which enrolled just under 17,000 students in 2013, ranks as the 7th largest district in the state. Immediately, the administration began to roll out cuts to transportation, programs and schedules that directly affected the lives of thousands of students and staff. It was these fiscal pressures that led the school to consider trying to do more with less. The summer after my junior year, the counseling staff approached the district administration about Naviance eDocs, a product that they calculated could save the school thousands of dollars by eliminating the paper and postage costs associated with completing the college application process. Once the district had approved the purchase of Naviance, MacNeel and the rest of the counseling staff went to work on preparing the school for the platform. At that time, each counselor was personally responsible for advising over 450 students. The Naviance platform quickly became the only feasible option for providing each student with the one-on-one counseling they needed to develop a college and career plan. Naviance was just the first step in finding solutions. 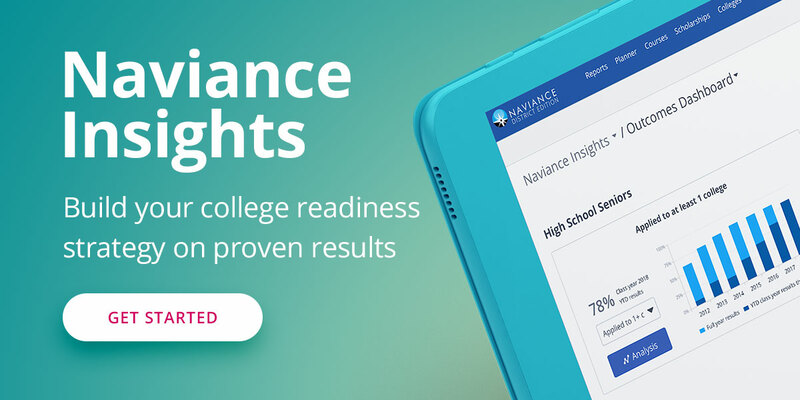 MacNeel found that a gradual approach to rolling out the product was the most effective way to help staff and students take advantage of the many college and career readiness features of Naviance. After a successful year of using Naviance programs, the staff could look back on the comprehensive student engagement reports to see what worked and what aspects they might want to improve upon in the future. The Lakota East staff decided that the best way to layer the Naviance roll-out would be by grade level. Since the college application process was the most pressing concern, the school focused on eDocs and college search for graduating seniors for the first phase of their implementation, with plans to expand into other grade levels in following years. The administration adapted their program around professional development in a similar way. At first, the school purchased training hours to help administrators and counselors learn the basics. After everyone felt comfortable with the product, the administration used Naviance Consulting to maximize engagement and the effectiveness of the implementation. Now three years into its subscription, Lakota East has successfully created and assigned custom tasks and individualized learning plans for all of its students in grades 11 and 12, and is scheduled to include grade 10 in 2014-2015. While the high school continues to improve the way that it utilizes the Naviance platform, MacNeel recognizes that they still have room to grow.